Hybrid publishing is a new model of publishing in which an author works with a publishing company but pays to publish in exchange for higher royalties. Some in the publishing industry disregard this new category because the idea of paying to publish suggests (to them) poor quality, like the books that vanity presses produced years ago. However, hybrid publishing is not vanity publishing. The hybrid press vets books before agreeing to publish them and offers active distribution. The new model is a win-win: presses can afford to put out more books, contributing their knowledge and clout, and authors have additional venues to approach and the opportunity to make larger royalties—over 50 percent, compared with about 10 percent with traditional publishers. Unfortunately, the publishing world is cluttered with scam artists, and the various publishing models that now exist create confusion and enable these scammers to take advantage of authors. Many companies have started using the word “hybrid” since hybrid publishing has gained some acceptance. 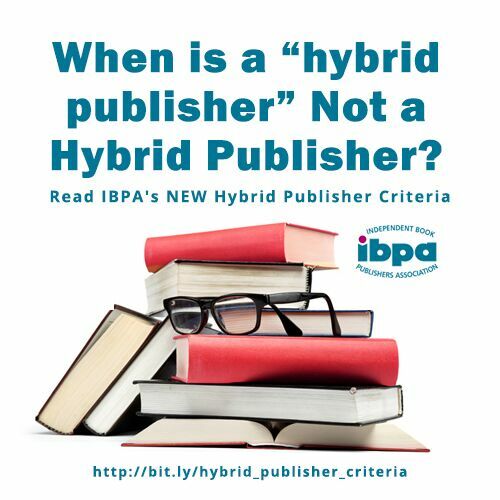 To help legitimate hybrid presses and authors continue to connect, this month the Independent Book Publishers Association (IBPA) announced a set of criteria for hybrid publishers. 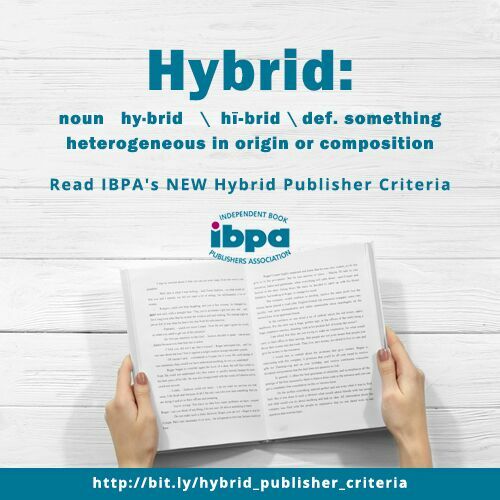 If you’re an author interested in working with a hybrid publisher, the criteria can help you filter your options. A hybrid publisher has a mission and a vision, and doesn’t just publish a mishmash of books. A hybrid publisher vets submissions, rather than publishing anything it can. A hybrid publisher has a knowledgeable person or team producing books under the publisher’s imprint, with the publisher’s ISBNs. A hybrid publisher’s books meet industry quality standards; readers should not be able to tell them apart from traditionally published books. A hybrid publisher uses approved editors and designers to produce professional books. A hybrid publisher manages a variety of rights for the book (print, digital, and possibly others like audio and foreign-language) or negotiates with authors who want to keep some rights. A hybrid publisher provides distribution beyond simply making the book available online. This can involve sales reps who actively market the book or targeted outreach, and also involves listing the book with wholesalers. The publisher should have a marketing strategy for each book and assist the author in carrying it out. A hybrid publisher should have several books that show respectable sales. A hybrid publisher pays higher royalties than is standard in the industry, usually greater than 50 percent of net on both print and digital books. 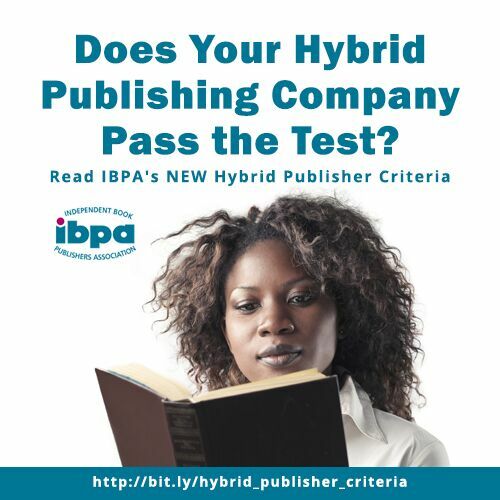 You can view the IBPA’s full criteria here: http://www.ibpa-online.org/page/hybridpublisher(click on the “expanded details here” link to see the detailed version). Ask about the criteria listed above: does the publisher vet submissions, partner with authors on marketing, and have some form of active distribution? Hybrid publishing is an exciting new option for today’s authors, and will contribute more good books to the world! This entry was posted in For Authors, For Editors on February 23, 2018 by Emily.